(Click here to view Figures 1-6 in a DICOM Viewer Powered by Exa™. 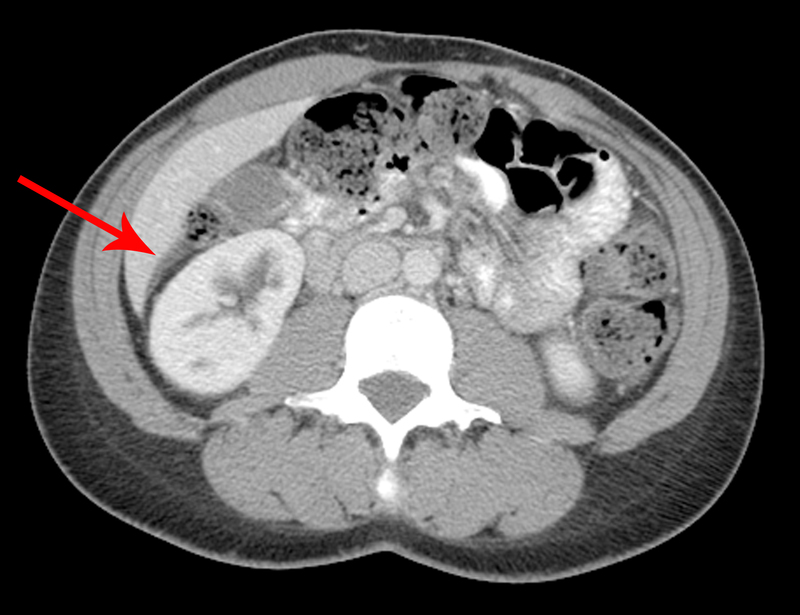 A 45-year-old female presented to the emergency department with acute onset suprapubic crampy abdominal pain and increased urinary urgency and frequency. Pertinent medical history included prior resection of a benign, non-specified bladder mass two years previously at an outside institution. Review of systems and physical examination were unremarkable with the exception of diffuse lower abdominal tenderness without rebound. Laboratory results including urinalysis and vaginal wet prep were negative. Transabdominal and endovaginal pelvic ultrasound was unremarkable. 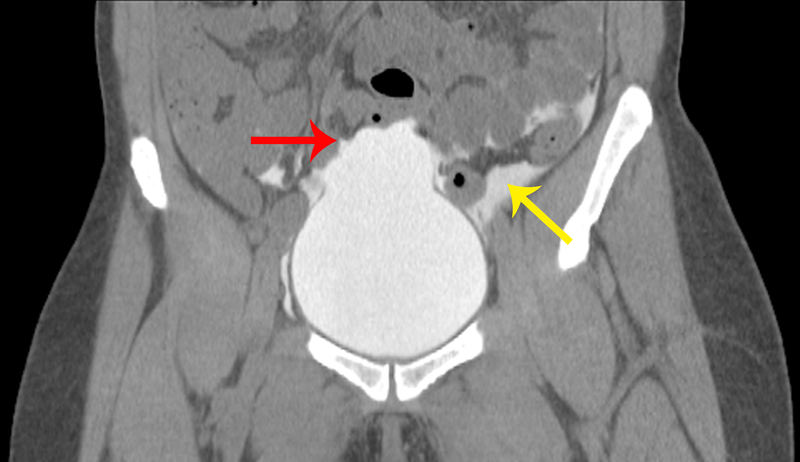 Subsequently, a contrast-enhanced abdominal and pelvic CT scan was performed, demonstrating a focal fluid collection contiguous with the bladder dome felt to represent a congenital or acquired/post-operative bladder diverticulum or atypical urachal remnant. The patient was discharged but returned two days later with shortness of breath and abdominal distention. A new large right-sided pleural effusion was observed, ultimately confirmed to be a urinothorax secondary to bladder dome rupture at site of prior surgery. 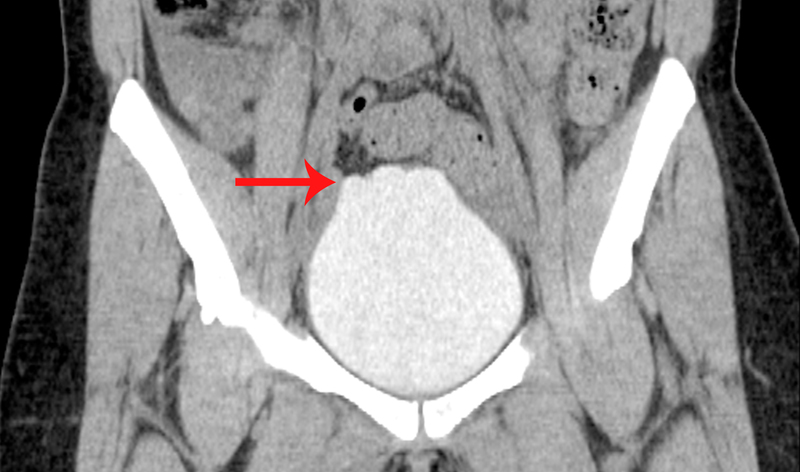 Contrast-enhanced CT imaging of the abdomen and pelvis on initial presentation demonstrated a thin walled diverticulum arising from the bladder dome at site of prior surgery (Figure 1). No regional sizable extra- or intraperitoneal fluid collections were observed, and the surrounding pelvic fat planes were maintained. 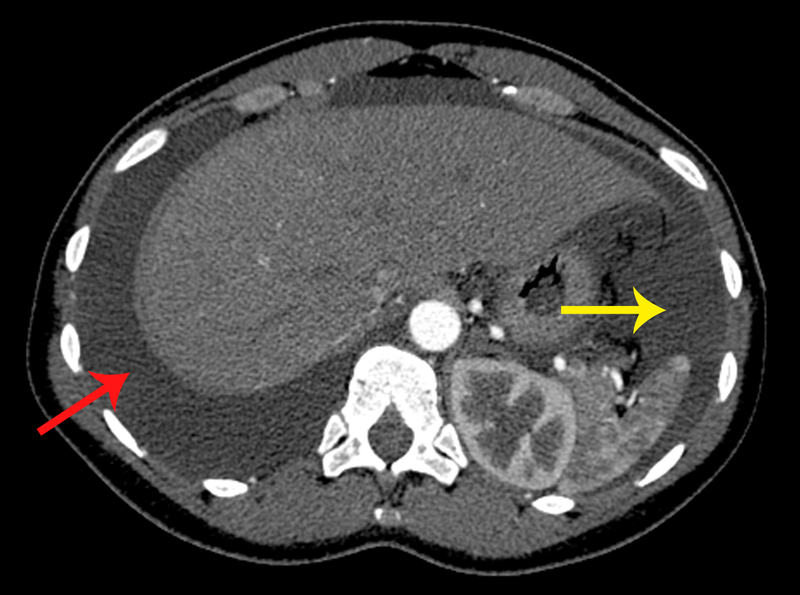 A trace amount of fluid was retrospectively noted in Morrison’s pouch within the right subhepatic space, potentially a herald leak from the weakened diverticular bladder wall (Figure 2). The patient was discharged only to return two days later with shortness of breath and complaints of abdominal distention. A large right-sided pleural effusion was observed on chest radiography and CT pulmonary angiogram, appearing simple in density and non-loculated (Figure 3). Extensive ascites was also observed (Figure 4). Thoracentesis yielded over two liters of transudative fluid notable for elevated creatinine, greater than concurrent serum levels, raising concern for a urinothorax. Of note, at this juncture, additional history was elicited from the patient detailing a similar episode of shortness of breath one year previously occurring in conjunction with a large pleural effusion, treated at the time with catheter drainage at an outside institution, without apparent further work-up. 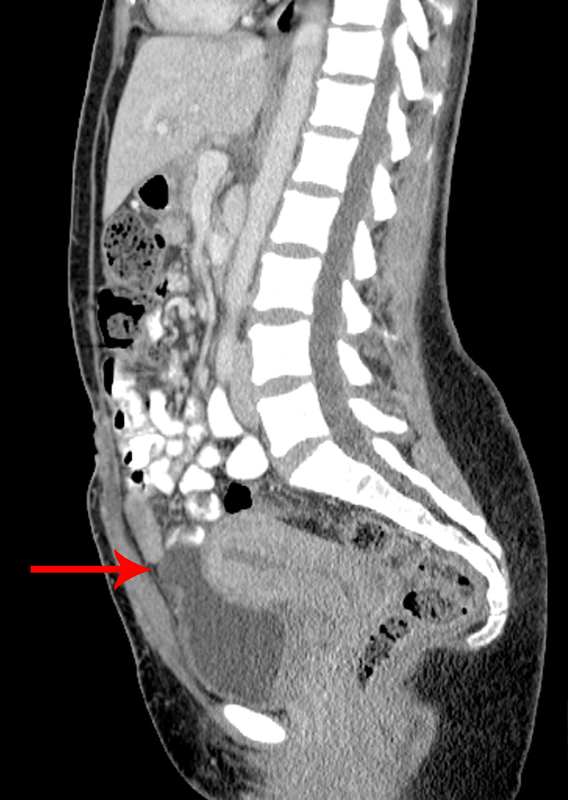 CT cystography confirmed intraperitoneal bladder rupture at the dome with active extravasation into the peritoneal cavity (Figure 5). The patient was treated with a partial cystectomy and resection of a ruptured post-operative bladder dome diverticulum. Recovery was uneventful (Figure 6). The final diagnosis in this case was a urinothorax occurring in conjunction with intraperitoneal bladder rupture of an acquired bladder dome diverticulum. Given the rapid development of abdominal ascites and pleural effusion over the course of days, malignant related etiologies were felt unlikely. No contributory enteric inflammatory findings, or either free or localized intra- or extraperitoneal air was seen to suggest viscus rupture. The absence of peritoneal thickening and enhancement as well as the lack of pre-existing ascites or peritoneal catheters militated against spontaneous bacterial peritonitis. Likewise, there were no contributory laboratory or imaging findings to support acute hepatic decompensation, favoring the subsequently proven diagnosis of urinothorax and bladder rupture. In summary, though rare, urinothorax should be considered in the setting of urinary tract obstruction or trauma, iatrogenic or otherwise, in conjunction with a rapidly accruing pleural effusion together with either an intra- or retroperitoneal fluid collection. Both rapid and widely available, contrast-enhanced CT urography or CT cystography is the imaging study of choice for evaluating the integrity of the upper or lower urinary tract, respectively. Though thoracic accumulation of urine may occur in the setting of a pre-existent diaphragmatic disruption, in the majority of cases diaphragmatic integrity is maintained. Thoracentesis is both therapeutic and diagnostic, with urinothorax aspirate characteristically demonstrating an elevation of creatinine above serum levels. Management typically entails prolonged or repetitive thoracic drainage together with urinary repair or diversion. Tortora A, Casciani E, Kharrub Z, et al. 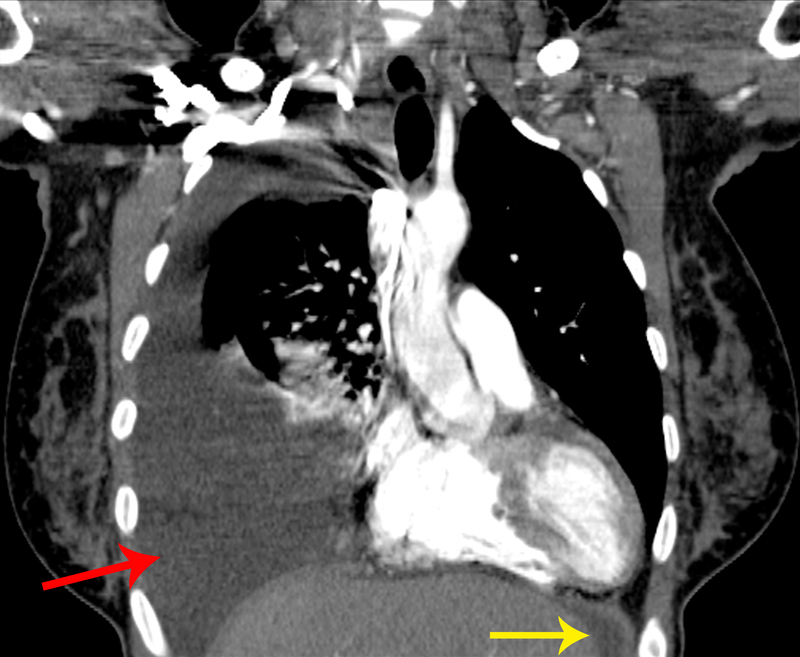 Urinothorax: an unexpected cause of severe dyspnea. Emerg Radiol. 2006;12:189-191. Kinasewitz G. Transudative effusion. Eur Respir J. 1997;10:714-718. Lahiry S, Alkhafaji A, Brown A. Urinothorax following blunt trauma to the kidney. J Trauma. 1978;18:608-610. Casallas A, Casteneda-Cardona C, Rosselli D. Urinothoraz: case report and systematic review of the literature. Urol Ann. 2016;8(1):91-94. Hase T, Kodama M, Domasu S, et al. A case of urothorax that manifested as posttraumatic pleural effusion after a motorcycle crash. J Trauma Crit Care. 1999;46(5):967-969. Akpek S, Ilgit E, Arac M, et al. Bilateral perirenal urinoma with mediastinal extension. Abdom Imaging.1995;20:267-269. Oguzulgen I, Oguzulgen A, Sinik Z, et al. An unusual case of urinothorax. Respiration. 2002;69:273-274. Miller K, Wooten S, Sahn S. Urinothorax: a cause of low pH transudative pleural effusions. Am J Med. 1988;85:448-449. Baugh A, Youssef E, Hasan S, et al. Nephropleural fistula effectively managed with serial thoracentesis: a case report. J Endourology Case Reports. 2016;2(1):212-214. Urinothorax occurring in conjunction with intraperitoneal bladder rupture. Appl Radiol. Prepared by Dr. Cressman while a Diagnostic Radiology Resident in the Department of Radiology; and Dr. Rheinboldt while in the Department of Radiology, Emergency Radiology Division, at Henry Ford Hospital, Detroit, MI.